Rogers and Fridmann not only tapped into a wealth of recording and producing experience for THE DARK SIDE, but had the gear to match. Many individual instruments were processed through 5 or 6 effects units, some of the vintage and esoteric tube variety owned by the pair. 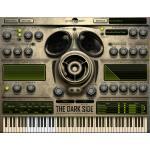 THE DARK SIDE distorted and mangled instruments are designed to stand out in a mix, or to disturb the senses. With today's brick-wall limiting, distorted instruments may be the only production trick left to highlight instruments, a successful technique used often by Radiohead, Muse, Nine Inch Nails, etc. Many instruments have been purposely--and skillfully!--mangled, distorted, or effected out of all recognition (plus a selection of dark and eerie instruments).